While an El Niño has not yet been officially declared, the telltale water temperatures and wind patterns that are associated with an El Niño are all in place and I expect an official move from an El Niño Watch to an Advisory in the near future. The forecasts for this winter are less certain than in the very strong El Niño of 2015-2016, which means that we are less sure of what the winter climate will actually be than in that winter. This El Niño has been slow to develop, and we are just starting to see the classic weather patterns that are often associated with El Niño, including a strong storm track across northern Florida and southern Georgia and Alabama. The storm track is likely to bring cooler and wetter conditions to that part of the Southeast over the winter as the subtropical jet stream pushes storm systems through the area. Cooler temperatures are due in part to the increase in daytime cloudiness that comes along with the rain and storms, and does not necessarily mean that we will see more cold nights or frost. 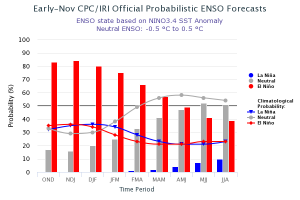 However, in any weak to moderate El Niño, there is a larger chance than usual of variability in the large-scale weather patterns across the US, and we could see periods of well-below normal temperatures as the polar jet stream dips south across the Eastern US, even as the general trend in temperatures in the Southeast is towards warmer temperatures. Even though late frosts are not particularly associated with El Niño winters, if our weather gets locked into a cold pattern in February or March, it could be an issue. However, cooler temperatures over the winter could help with the number of chill hours for fruit crops and delay the development of buds and flowers until later in the spring than we have seen in the past few years. With that said, I expect southern Alabama and Georgia as well as northern Florida to see cooler than normal temperatures and wetter than normal precipitation over the next few months, although it may vary quite a bit over the season. Folks that are farther to the north, including northern Alabama and Georgia, are going to see more variable weather, including the possibility of more cold air outbreaks and less precipitation. The El Niño is expected to last until spring but is likely to go back to neutral conditions after that, since El Niños seldom last more than one winter. Soil moisture conditions for the 2019 spring planting season should be good although there may be some areas with too much moisture. The drought likelihood for next growing season is reduced after an El Niño winter because more moisture is retained in the soils going into the next summer. This is good news for producers who have seen some dry conditions develop this year in areas away from the paths of our 2018 tropical systems. For a detailed discussion of all of the global and regional climate factors that go into the winter forecast, you will be sure to want to read the detailed discussion put out by the State Climate Office of North Carolina this week. Although the specific impacts on Georgia, Alabama and Florida differ somewhat from what is likely to happen in North Carolina since NC is farther north and east, the basic discussion on these patterns should be very helpful in putting this coming winter in context. You can read it at http://climate.ncsu.edu/climateblog?id=273&h=5666e5c1. 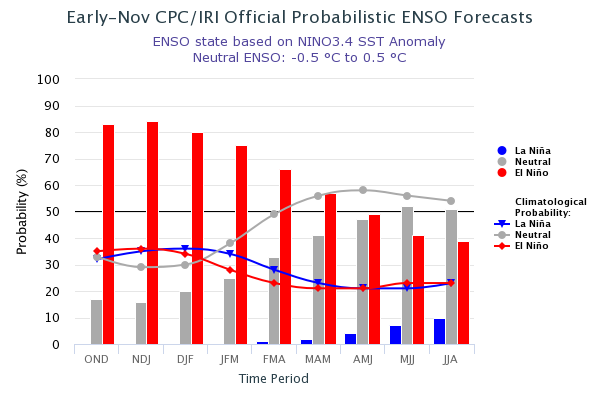 Posted in Climate outlooks, El Nino and La Nina. Bookmark the permalink.